and pick up my father. but he’s also a little fearful. than he was last year this time. He won’t talk very much. He’ll lie in bed several times. It will be a different holiday for us. And for a long time there wasn’t. like I’ve always known him to be. for him, for me, for our whole family. you didn’t expect to end up. to a child with Down’s syndrome. you find yourself in Holland. If you spend your life mourning the fact that you didn’t get to Italy, you will never be free to enjoy the very special, very lovely things about Holland. We didn’t quite anticipate this destination. we’d be seeing about now. very lovely things to experience. sometimes almost child-like, physical needs. without the encumbrance of words. such simple comfort in his bananas. that I have never heard before now. 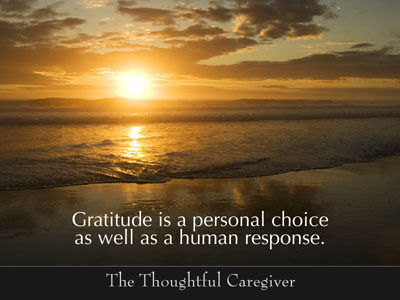 This entry was posted on November 21, 2007 at 9:51 am and is filed under Caregiver Truths, Caregiving, Caregiving & Feelings, Caregiving Lessons. You can follow any responses to this entry through the RSS 2.0 feed. You can leave a response, or trackback from your own site. tears…lots of tears as I read this.